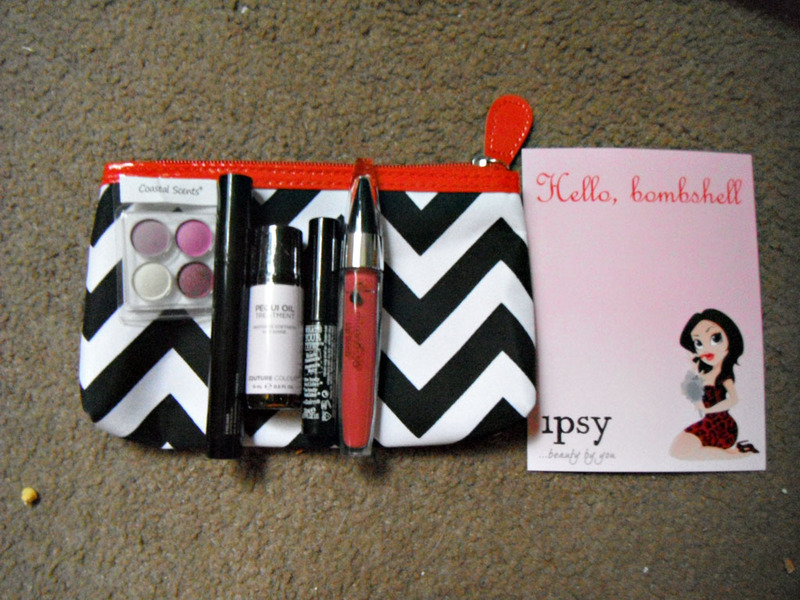 After last month's great Ipsy bag, I was really excited to see what they would come up with this month! I'm really interested to see how the new more customized bags will work out. So, I was really excited to find mine in the mail this morning! What did I get? This month's theme is "Hello Bombshell" and it's full of products to help us have a "bombshell moment". 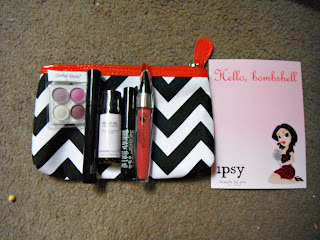 This month's bag contains two full sized products, and four makeup items! The first thing I am excited about this month is the bag itself! How cute is the chevron pattern and the black, white, and red color combo? On top of that, it is very good quality. It's a durable material, and is also lined in the red. This will be going into my purse immediately! My favorite bag to date. Now, onto the products themselves. First, we got a deluxe sample of Couture Colour Pequi oil treatment. This treatment promises to make hair stronger, shinier, and smoother after even one use. This is a .5 oz sample, and is a very generous size that should last me a while. I love hair oils...I'm currently trying to pamper my hair as I slowly grow out the haircolor I've been using for years, so anything to help it stay happy and healthy is a welcome addition to my routine. Super excited to try this out! We also got a deluxe sample size of What's Your Type mascara by theBalm. I received Body Builder, This is what it sounds like - it promises to add body to your lashes, as well as definition and length. It is free of parabens and also promises to condition. I am a mascara junkie, and I LOVE theBalm, so I am really excited about this one! Also included was a full sized Be A Bombshell liquid eyeliner in Onyx! This is a chubby marker-type liner that is smudge proof and easy to use. I am always happy to receive a liquid liner, and this one looks nice. Will be great for creating a cat eye look! The last two products are color makeup products, and they sent out different colors to subscribers. They say that they will be using our preferences and skin tone/coloring to be choosing our products. I was excited to see how they did! My profile states that I am very fair with green eyes and naturally blonde hair (currently dyed brown, but growing out). I'm happy to say that I did receive shades that will work well for me! The first is a tiny eyeshadow quad by Coastal Scents. They sent out 8 different quads with different colors, ranging from brights to neutrals. Each one has one matte and three satin/shimmers. I received the number 7 quad, which was my first choice! It contains the following colors: (clockwise from the top left): Antique Lilac, Wisteria, Lemon Chiffon, and Raspberry Tart. These are great colors for my green eyes. This is my first experience with Coastal Scents, and the shadows seem really nice for the price! They are creamy and pigmented and I can't wait to wear them out. I will definitely be buying more shades or possibly one of the large palettes! Very impressed with the quality for the price. 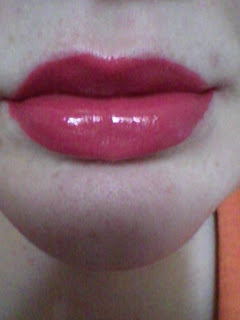 And finally, a full sized Lip Bomb by Mirenesse. 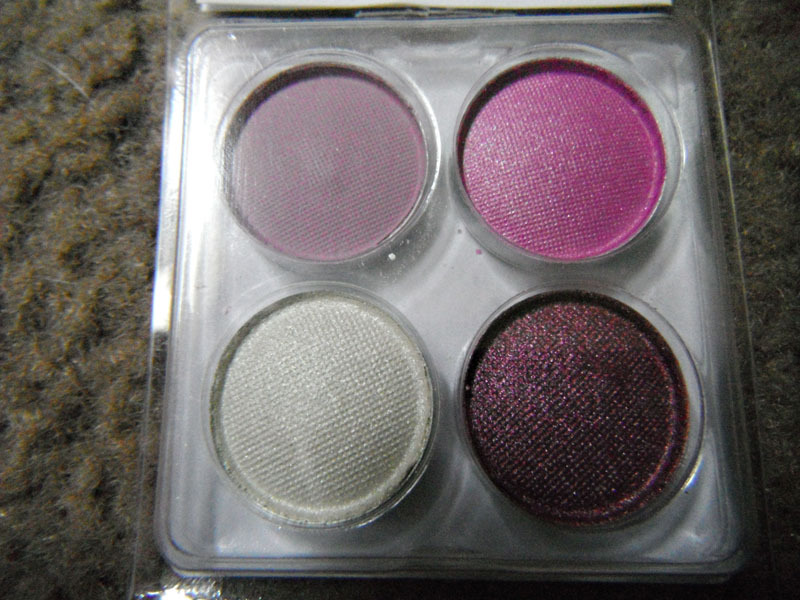 They sent out three different shades of this one...I got the color Mirror Me, which is a very vibrant darker pink. This looks like another lip gloss, but it actually isn't. It's a Glossy Lacquer Stain. This is crazy pigmented...more so than any gloss OR lipstick I have ever tried! 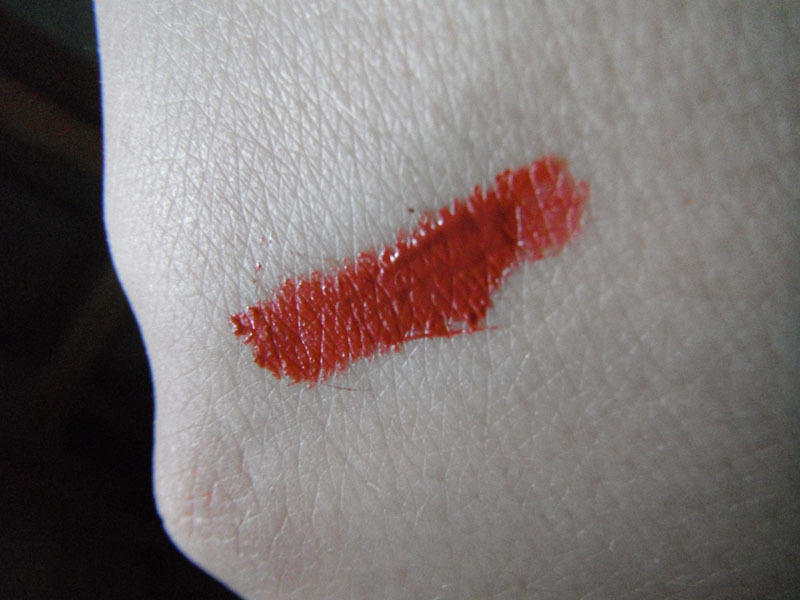 One quick sweep and it is vibrant and fully opaque. It is very smooth and nonsticky and the formula is truly amazing. This is a quick swipe on my skin, it stayed until I removed it with soap and water! And finally, one quick very thin coat on the lips! 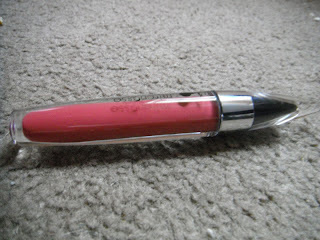 It is glossy but not too glossy and super, super pigmented. I put it on and it has lasted for two hours, so far. The above photo is after about 45 minutes of wear, and that includes eating a cookie and drinking! Very impressive, as lip colors never last on me. All in all, I think this is a pretty amazing bag. Four makeup products including two color products, and the two sample sizes are truly deluxe. Awesome! This bag has a retail value in the $70 range and every single item will be used. Happy! 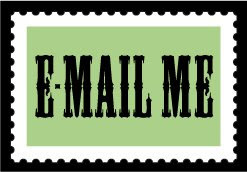 What do you think about Ipsy/myGlam's changes? Disclaimer: I bought this bag with my own money. All opinions are my own and I was not compensated. The Lip Bomb is so freaking pretty! Isn't it?? I am so impressed with it! The pink lip bomb is really pretty. I'm surprised by how crazy pigmented they are! we received the same lip bomb shade but i got the eyeshadow set #2.. i like mine but i love yours more ;) this bag was aweeesome! I was really hoping to get 1, 2, or 7 so I was happy :) Lots of pretty colors...I may have to buy one of the big palettes.